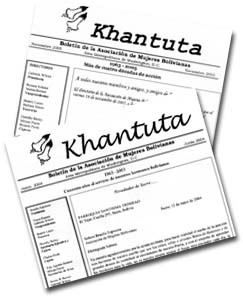 The name of the ASSOCIATION OF BOLIVIAN WOMEN of the Washington DC Metropolitan Area's newsletter is Khantuta. Khantuta in Spanish is published monthly. Khantuta in English is issued three times a year. Khantuta is the national flower of Bolivia, it has red, yellow and green colors, just like the flag. Click Here to download our latest newsletter which talks about our 50 years of Life and Action.